Yet another top five warmest record for a particular month has been set globally. Unfortunately, this is becoming a common occurrence as the planet continues to trend warmer. 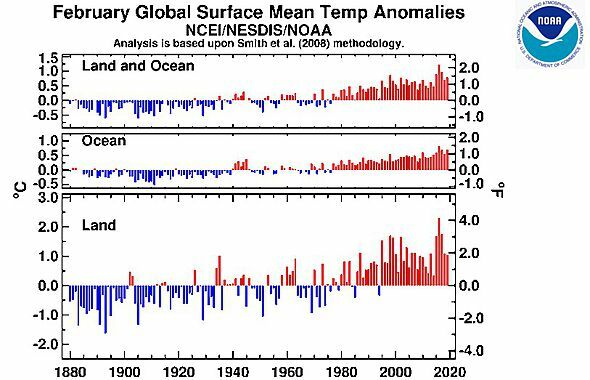 Today, we will look at three different sources for the February 2019 global surface land/ocean combined temperature anomaly data. Keep in mind, some of the differences you see in the temperature anomaly numbers is due to the fact that these sources use different base periods. Unless otherwise stated, the surface temperature databases go back to 1880. The bitterly cold area of western Canada during February sticks out like a sore thumb! February 2019 was the third warmest February on record globally, averaging 0.92 of a degree Celsius above the 1951-1980 mean. The warmest February on record occurred in 2016 followed by 2017. 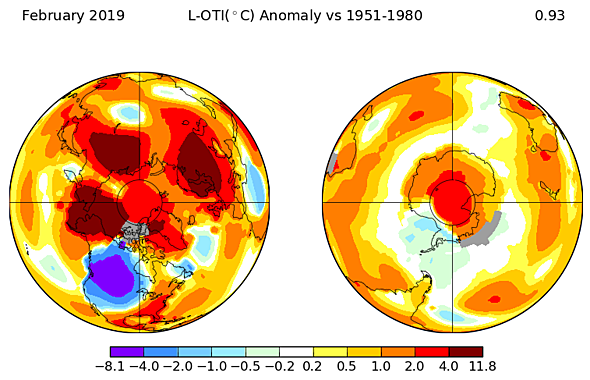 February 2019 was the sixth warmest February in the Northern Hemisphere and the third warmest February in the Southern Hemisphere. February 2019 was the fifth warmest February on record globally, averaging 0.79 of a degree Celsius above the 20th century average. 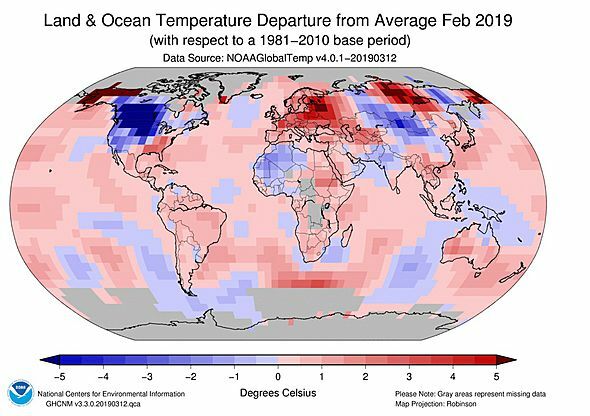 February 2019 was the 10th warmest February on record in the Northern Hemisphere and the second warmest February in the Southern Hemisphere. In terms of global ocean sea surface temperature anomalies, February 2019 was the second warmest on record for February, averaging 0.70 of a degree Celsius above the 20th century average. NOAA predicts that the full year of 2019 has a 91 percent chance of ranking in the top 5 warmest on record and a 99.9 percent chance of ranking in the top 10 warmest on record globally for land/ocean surface combined temperature. 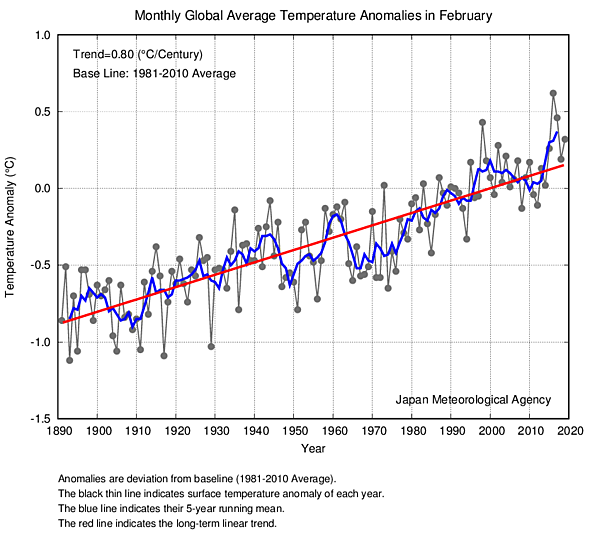 February 2019 was the fourth warmest February on record, averaging 0.32 of a degree Celsius above the 1981-2010 mean. That figure rises to +0.74 of a degree Celsius when measured against the 20th century average. The JMA also states that global temperatures are rising an average of 0.80 of a degree Celsius per century.